The NFL will not be holding Regional Combines in 2019. The National Football League launched the NFL Regional/Super Regional Combines program in 2012 to serve as a supplement to the League’s National Scouting Combine. They are designed to provide an opportunity for participants to display their pro potential. NFL Regional Combines are conducted specifically for persons eligible for the 2017 NFL draft that are not participating in the National Scouting Combine. 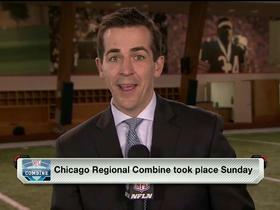 NFL Regional Combines are not fantasy camps. Applicants must meet NFL eligibility rules and be able to perform at a high skill level. The NFL reserves the right, in its sole discretion, to reject any applicant it determines to be unqualified or unfit to compete. NFL Regional Combines are held in NFL club facilities and participants are tested and reviewed by experienced NFL scouting personnel. Participants’ measurements and Combine results, including video of their drills, are compiled and entered into a database accessible to all 32 NFL clubs. This data will be posted to the Regional Combines website after each event. Each participant will be able to access their profile page containing their results and video and have the option to share their page socially via email, Facebook, Twitter, and Google+. Please note that NFL Combine staff shall have sole discretion in deciding which positions a player registered as a Quarterback (QB) throws to during the Combine. By clicking CONTINUE, you are deemed to have acknowledged and agreed that as a player participating in the combine as a QB, you may not be making the same throws as other quarterbacks at the Combine and that certain players participating as QBs will not have the opportunity to throw to wide receivers. Please click CANCEL if you do not agree to these terms. Please enter your security answer and email address below, and your password will be emailed to you. Security Question: What is the name of your pet? What city were you born in? What is your favorite color? What is your favorite NFL football team? What is your your Mother's maiden name? Registration for the NFL Regional Combines is currently closed. If you have any questions, please email the NFL Regional Combines office at nflregionalcombines@nfl.com. Do you wish to receive information and offers from the NFL and its business partners? Yes, I would like to receive information from the NFL and its partners. No, I would not like to receive information from the NFL and its partners at this time. I understand I can change this setting in the future by visiting the My Account page. Were you on a college football team's roster during the 2016 season? Do you have college football eligibility remaining? Are you under contract to another professional football league? Are you a Punter or Kicker? You are unable to apply for NFL Regional Combines. Participation in NFL Regional Combines is restricted to players who were on a college football team this past season. Thank you for your interest. You are unable to apply for NFL Regional Combines. Participation in NFL Regional Combines is restricted to NFL draft-eligible players that have exhausted their college eligibility through participation. Thank you for your interest. You are unable to apply for NFL Regional Combines. Players under contract to another professional football league are prohibited from participating in NFL Regional Combines. Thank you for your interest. You are unable to apply for NFL Regional Combines. Participation in NFL Regional Combines is restricted to position players; specialists such as kickers and punter are not eligible. Thank you for your interest.